The stunning silver saw palmetto is supremely easy to grow, creating a more ornamental version of an old-fashioned Florida plant. 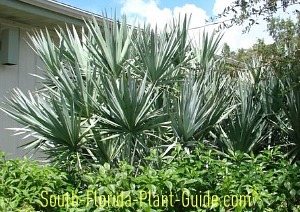 Saw palmettos are native to Florida and the southeastern United States, and the less common silver variety is a uniquely colored landscape plant for a naturalized look. Perfect as a filler, hedge, backdrop or accent, these striking plants add old-Florida charm. The "saw" in the plant's name refers to the saw-like teeth on the leaf stems. Since a palmetto plant rarely needs pruning, you won't come in contact often. An extract made from the saw palmetto has been used for hundreds of years by everyone from Mayans to Florida's Seminole Indians for a wide spectrum of medicinal purposes. Currently saw palmetto extract is hailed as an alternative medicine for prostate problems. Palmettos can handle full sun to complete shade, growing slowly to a typical height of 3 to 6 feet. Grow in any Florida zone - it can take the cold. This plant will spread out, though it takes many years for one to cover a large area. It grows thick and dense, with no visible trunk since the base of the plant remains close to the ground. The high salt tolerance of the silver palmetto makes it an ideal planting for a home on the water. These plants are considered to be deer resistant, though there are no guarantees. This is one palm that's about as maintenance-free as it gets. No need to bother with cold protection or even fertilizer (a once a year application of granular fertilizer is fine but not necessary). 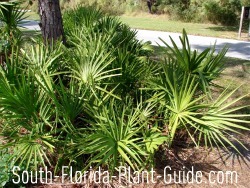 The saw palmetto palm is drought-tolerant (once established) and highly salt-tolerant. You'll want to trim off browned fronds now and then to keep a clean look. Cut the stem as close to the ground as you can. 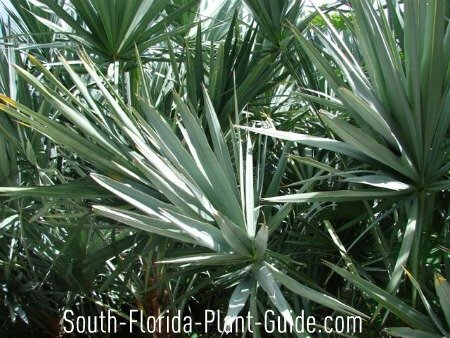 Plant in plain old sandy Florida soil - no need to add soil amendments, since this beautiful little palm grows naturally in southern oak hammocks, pine forests and open fields. Palmettos will spread so spacing can vary. For an instant hedge, plant them as close together as you like. You can place a silver saw palmetto next to any structure - house, wall or fence - or under trees directly against the trunk. They make great container plants for large pots or planter boxes and will be happy there for years. COMPANION PLANT SUGGESTIONS: Use with other low-care plant varieties such as oleander, dwarf Fakahatchee grass, kopsia tree, cocoplum, clusia, frangipani and railroad vine.